Dirk Rees is a photographer who has shot with Ricky Gervais and Marco Pierre White. Of all his shoots, I particularly like this one called "In Motion". 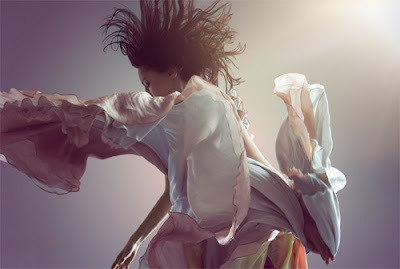 It is a beautiful fluid shoot which is dynamic and colourful (pictured). 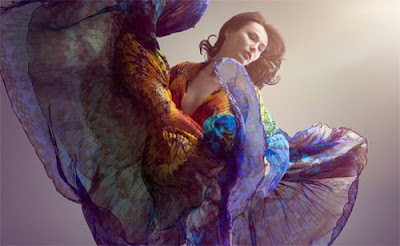 Not all the movements are very natural, but the first shot with the rainbow coloured dress is a particularly good one. It reminds me of the photographs of Alix Malka which were taken underwater, but this was obviously achieved above. I also like his other shoots "Future Love" and "Cube".